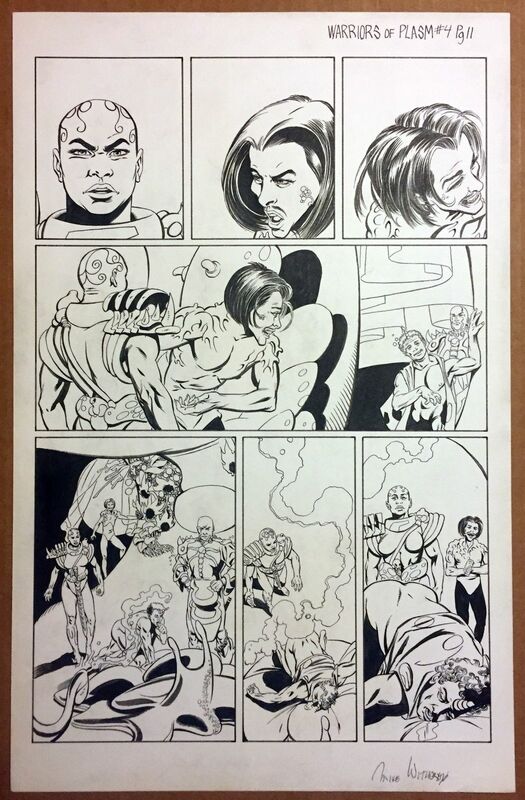 The original art to Warriors of Plasm 6 just sold a few days ago on eBay for 240.00. Dave Cockrum Home For the Holidays page sells on the Bay. I had to choose between Great Grimmax Art, Dark Dominion art (with John Ridgeway!! ), and Home For the holidays art when I bought pages from Dave Cockrum's widow. I opted to pass on the home For the Holidays art. This is probably a page that I passed on buying. She limited how much I could buy because she was afraid she'd sell out too fast. This book was my least favorite thing that Defiant published. Warriors of Plasm 2 cover moves at 482.00. Joe James art for Dark Dominion has been selling online for $29.95 BIN. I have strong opinions about seeing the art online, but I was soured to buying anymore Defiant artwork about 10 years ago so I'm treating this as water under the bridge. I'm just going to keep my mouth shut. Joe visited my old board once. My impression was that he was going to hold onto his artwork. My hope is that he's getting what he wants for it and isn't selling it out of necessity. The price seems horribly low to me. I also question the low quality presentation of the auction ads. I thought a reputable art dealer would've made an attempt to post better images to attract buyers. Here's the color art to the cover for Warriors of Plasm 6. Another one I don't have! LOL! I added an image to the top post. Not sure if you need to reduce that or crop it, Defiant1. Dogs of War 4 page 21 (splash) for sale on the Bay. Dogs of War 4 page 11 for sale on the Bay. I reduced the width to 500px. Maybe this will increase the value of my art. Even harder to believe! Two pages from this series that I don't own with excellent scans. Looks like a giant eyeball is right behind them. Are you still buying original art at all, Defiant1? I haven't bought any in a long time. If the price is right and terms are right I would not rule it out. My budget is tight. I'm financially helping someone right now who is in a tough situation. I can still afford it but the terms have to be right. If I bought those pages above, the starting price is already above what I was paying since I bought in bulk lots directly from the artist. The opening bid of 24.99 was met, and that's the final selling price. I don't think I paid that much for any of my Dogs of War art. Even the cover I own was tossed in at the page rate I paid for the others. The non-splash Dogs of War page was relsited and this time it got two bids and ended at 22.50. The non-splash Dogs of War page was relisted and this time it got two bids and ended at 22.50. I'm not surprised that it sold for a loss. It is my belief that the art has more value as a set and that selling pages like this individually decreases their value. Dark Dominion 4 pencils only , with unpublished panel. I can definitely see Jim Shooter rejecting that page. I'm pretty sure he'd dislike 2 smaller panels floating above the larger one. Hovering panels like that can be more dynamic, but they can also be distracting. The reader's our eyes will eventually be looking at what the panels are blocking instead of what your eyes are supposed to be directed towards which is the content inside the bottom 2 panels. That should be Charles Adlard's pencils. If so, it's some of the best work I've ever seen him do. It seems like these 3 DEFIANT pages have been on eBay for some time now. I don't understand the point of amassing a huge collection of rare stuff and then just selling it off a year or two later. I never thought of Iggy as a shrewd buyer going for the best price. I never thought of him a someone just going for the high mark-up flip either. Buying these then and selling them so soon after the purchase doesn't make sense to me. I don't know the guy, so it just baffles me. I can't speak for him obviously, but I've been known to do compulsive things that make no sense on occasion. These are somewhat noteworthy one-of-a-kind items that he at wanted some point. Once they sell it is unlikely that he'll ever get them back. I feel that people should strive to know thyself. If he bought them with the intent to sell, that's fine. It just drastically changes my perception of him as a collector. I would immediately offer him less for anything he's selling because I know he has no emotion invested in it. If he's selling for budget/financial issues or to reallocate funds for something better or more important, that too changes my perception. I'd be more willing to pay more, but I'd question his long term decision-making abilities. I'd be less interested in dealing with him on business matters. The same is true if he simply changed his mind. I prefer not to deal with people who don't know what they want. None of this relates to who he is as a person. It simply relates to how I'd respond if he offered to sell me something. This is along the lines that if I look out the window and see a dark cloud, that might be my clue to carry an umbrella with me. It has nothing to do with whether I believe it will rain. It is simply a deciding factor in how I choose to respond. It's interesting to see the original art, but NO WAY IN HELL would I pay that. $300 at the VERY most and I'm still not interested in buying it at all. Nice piece of color art for sure. It was a hell of a lot cheaper and it was the art actually used for the cover. I wonder if JayJay had to run an X-ACTO knife around the edge of all the foreground stuff. That looks to be a royal pain if so. Here's a pic of the Birth of the Defiant Universe original cover art, taken from the auction listing. I saved a copy. I bought a new computer. It's going to take forever to get back up to speed. I'm seeing that some old software won't run on it. I was just saving the pic to document it on the board. Yeah. That's a great idea. Once I get back up to speed I'll crop it down and try to clean it up a little. It'll take months most likely. Cool. I'm always surprised when an eBay seller posts a pic like that without any effort to clean it up... especially on an expensive item. I fully agree. It isn't helping a buyer decide. The seller of the Birth of the Defiant Universe cover art says in the listing he's had it since 1994. That makes sense. I've never seen it offered before. Nice! That's an important piece of art! How do you know you are getting an original if you buy something like this online? A talented artists could copy it and try to sell it as an original. It is possible for a talented artist to forge such a piece, but there's the risk of the real one surfacing and putting the forgery into question. I was going to say that it'd be hard to forge The Defiant logo on the art page, but I don't see it on this. It was probably drawn before they'd got the branded blank art pages. A risk, but less so because this seller is known to be ''into'' stuff like this. Not that he's infallible, but it's better than buying from a random seller no one knows. I'm confident that this is legitimate. I didn't notice who the seller was. 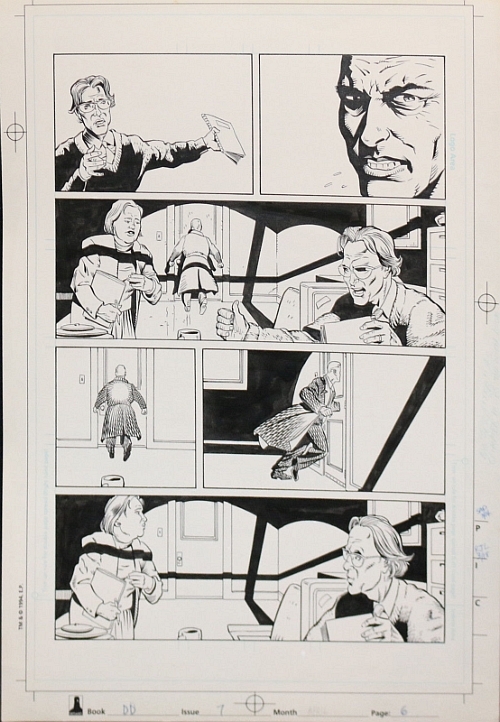 Lapham page from WOP 6 ends at $35 plus shipping after multiple bids. That is a horribly low price. It can be dangerous to list stuff auction style. I may have to start watching for that type of listing of DEFIANT art. The seller charged $18 shipping, so a few dollars more should be added to what we think of as the sale price on this piece. I added an image of the page that sold for reference purposes. I hope the seller doesn't skimp on protection. One thing you discover when you buy art is that Jim Shooter comics are story driven and finding dynamic art pages in any one issue is tough. It doesn't help that Lapham's name isn't on people's mind as much. Good point about Lapham not being in the spotlight. Yeah, the page pictured does nothing for me from an original art perspective. I want any pages I acquire to "look cool" or have something special about them. Probably also why I somewhat preferred color art when it came to Valiant, I thought they generally looked nicer, plus of course were cheaper! The problem with the Valiant & DEFIANT color art is that the Doc Martin watercolors are highly susceptible to fading. If you buy it to display, it will start fading. One inker had a name for the color art but I can't remember the word. It basically meant "hidden" because you have to store it away from light. I don't display mine, so I haven't noticed a problem. I think the Lapham page might've sold for more if it'd been from an earlier issue. This Dogs of War page is for auction on eBay. It's page 2 from issue 1. Opening bid 99.99, with 35.00 shipping. Nice page. Better than most of the ones I own. After making this post, I learned to add an image of the page that sold and the sale price as I add posts to this thread. It would be nice to be able to look back at this page and have the sale price documented, and just as important an image of the page that sold. After making this post, I learned to add an image of the page that sold and the sale price as I add posts to this thread. It would be nice to be able to look back at this page and have the sale price documented. I don't want to battle comic book auctions! I bet that Dogs of War page doesn't sell at that price. More than half of the series sold for as little as $5 a page. I paid a friend $5, $10, or $15 for a lot of the pages he had bought for $5. I felt I was paying a lot for the $15 pages because nothing was dynamic or exciting about them. That page is better than 90% of the pages in the series because of the composition and simplicity. It's also a splash page. I think the demand or desire to own the pages is very low. I can't imagine there are many people who'd want to pay that much for a page. It really has nothing to do with the art. It has more to do with the fact that the characters are very obscure and that you can get better collectibles for $100. Fans of Georges Jeanty are going to want a Buffy page. Fans of Defiant are going to want something by Lapham, Weiss, or Pollina. Pollina and Weiss art are rarely seen, so I suspect that they are not selling their comic pages. I think 'average' quality Joe James pages were selling below this. 'Average' quality Lapham pages are selling below this as evident in your post above. I think the pricing is very optimistic. I think there are people who would be tempted. I agree with you that I don't think the auction is going to connect with any buyers who would be willing to pay that much. If the seller contacted me, I'd be willing to pay $20 plus reasonable shipping charges. My goal is not to collect the art. My goal is to consolidate all the art pages back to one collection. I think the complete set of story pages gives the art pages more worth than any individual page would have on it's own. I like the fact that a lot of the EC art was sold by set as complete stories. Wow! Those pages went cheap early on!! I would not say "early on". 6 or 7 years elapsed. They went cheaply because no one was making offers on it. It was mostly sold in bulk in two or three large lots. Some pieces had been pulled aside and framed with a certificate to be sold that way. He kept those. Some better pages had been picked out of the artwork and sold individually. Nothing really stood out on the pages remaining. It's solid artwork, but the art is story driven. Without words or knowledge of the story, the images make very little impression. This piece sold for 134.99 with shipping. I'm glad the seller got that much. Warriors of Plasm #1, page 1 closes at $317 including shipping. Key pieces seem to be coming out of the woodwork. Same seller out of the Netherlands that sold the Dogs of War splash page from issue 1 last week. There used to be a letter writer from there back when the comics were published. Interesting. Perhaps he collected the art too. I'm saving that in my brain as a possible theory. I somehow came across this War Dancer two page original art piece that sold. Someone got a heck of a deal. Terrible listing. Seller out of Great Britian. I somehow came across this War Dancer tow page original art piece that sold. Someone got a heck of a deal. Terrible listing. Seller out of Great Britian. That's probably where Dave Taylor lives. This is what I'd expect the pages to sell for. Dark Dominion 9 JG Jones cover sells for $250. I've said it before, but iggy101us was buying up cool stuff and amassing a nice collection, now he's cashing in on one of a kind stuff. I can only imagine what he's buying next only to part with it. Maybe he became more passionate about a different area of comic related collecting. Not uncommon to see that happen. If it's true, I am actually curious what that would be. I've seen him continue adding impressive Valiant pieces to his collection. He continues building his collection of Valiant related items. Maybe he started branching out to DEFIANT and changed his mind. I just don't know if that type of thing is inordinately uncommon. I know a lot of people who were completely dedicated to obtaining the ultimate collection. At some point they lost interest and abandoned it all. Iggy was well on his way to an ultimate Valiant & DEFIANT collection for obscurities and rarities. I'm just curious if this is a spiral backwards or just a refocus onto something else. I can't even begin to count on my fingers and toes the number of collectors that abandoned the hobby forever. They were rabid to increase it and one day said "That's it" and sold it all off. Dogs of War 2 cover sells on eBay for $250. I saw the listing when you posted the last art piece selling. The Dogs of War 2 cover sold on a best offer for $250. I added that info to the post about the sale. I'm planning to add an image of the page this weekend. Hopefully I'll add a scan today to the post regarding the Dogs of War 2 cover sale. Image added to the post relative to the cover of Dogs of War 2 selling. Dark Dominion 7 JG Jones page sells for $55. That's probably an accurate value. Warriors of Plasm 4 page 11 sells for $45 including shipping. You'd think Lapham art would sell for more. Didn't this thread used to have images of original DEFIANT art that sold on eBay?